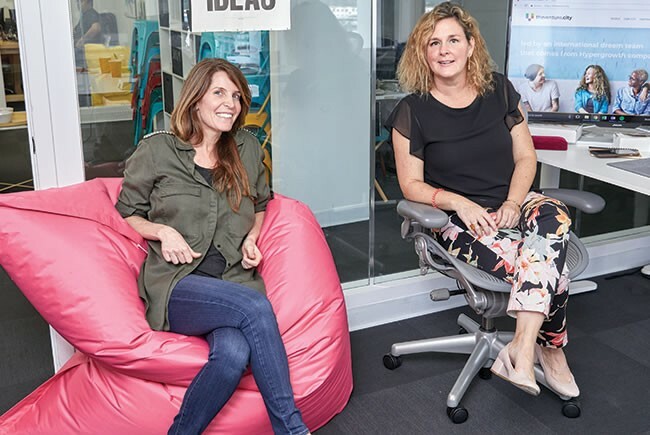 Clara Bullrich, left and Laura González-Estéfani say their business accelerator will invest $100 million in startups over a decade. South Florida's Venture City aims to take tech startups to the next level. South Florida has international business experts, multimillionaires and hip urban neighborhoods that lure young workers. But while the region generates plenty of startup businesses, it hasn’t become a hub where those startups grow and flourish. The south Florida metropolitan area, in fact, ranks first among the 40 largest metro areas in the rate of startup activity, but a lowly 36th out of 40 on a different measure that captures growth, according to the Kauffman Index of Entrepreneurship. Finance veteran Clara Bullrich and tech expert Laura González-Estéfani, both with global experience, see opportunity. In 2017, they founded a company called Venture City as a platform to link entrepreneurs, investors, experts and academics to boost growth for tech startups — and establish Miami as a tech hub on a par with others. Bullrich and González-Estéfani had discussed ideas for years before merging their knowledge of the finance and tech sectors. Bullrich was a managing partner for Guggenheim Partners Latin America/LJ Partnerships while González-Estéfani was an executive at Facebook. The co-founders started Venture City with their own money and with funds from investors. Venture City seeks to identify what the founders call “iguanacorns” — smaller versions of “unicorns,” a term that top venture capitalists use to refer to fast-growing startups with valuations of $1 billion. “We saw talent, born in south Florida — and with so many iguanas all over the place — maybe not unicorns but we have iguanacorns,” González-Estéfani says. The startups they work with are at different stages: Cabify, a Madridbased ride-sharing company, is already valued at $1 billion; Optimus Ride, a Boston self-driving vehicle company, expects to start carrying passengers this year. In Florida, Venture City has worked with Boatsetter, a boat rental company; Fast Mind, a social gaming intelligence platform; Above & Beyond, a global financial company; and RecargaPay, a mobile wallet and payment platform. Venture City ditched the model in which investors take equity up front. Instead, it takes equity along the way. Venture City supports a company’s growth over 18 to 36 months with financial strategy, product engineering, marketing and partner connections. So far the accelerator has invested $20 million in 16 startups with plans to invest $100 million over 10 years. Operating from an office on Lincoln Road in Miami Beach, Venture City has 18 employees in south Florida, Madrid, Sydney, Australia, and Silicon Valley and is considering expanding to Singapore this year. Jaclyn Baumgarten, CEO of Fort Lauderdale-based Boatsetter, says she isn’t in the accelerator program but has used Venture City as a consultant and investor. Boatsetter has access to 5,000 boats that customers can rent with or without captains in Florida, the Caribbean, Mediterranean and other markets. She said a key challenge in her business is how to convert online visitors to customers — an area of expertise that Venture City staffers have because they’ve worked for major online companies such as eBay, WhatsApp and Facebook.